Like a once-bloated balloon, the Bob Wall Memorial Tennis Tournament deflated as player participation curiously dwindled and dwindled in recent years. Finally, that balloon popped. All things must pass away. Liz Dwyer is all of 13 years of age, going on 14 (her birthday is Aug. 22). But she is not a typical 13-year-old. Most 13-year-olds don’t have her athleticism or tennis-playing ability. The match was the same. The opponent was the same. The result was the same. But the smile on John Czartosieski’s face was proof that he felt a lot better about his performance on Monday morning than he did last year when he prevailed over Richard Chizever in the men’s 50-plus singles final of the Bob Wall Memorial Tennis Tournament. Will Clemans hit some fantastic shots. He pulled out every trick in his book and played quite well in the Bob Wall Memorial Tennis Tournament men’s singles final. Afterward, he acknowledged that he had done just about everything he could. It was a performance he could feel good about. And he lost, 6-2, 6-1, to Chris Ujkic. 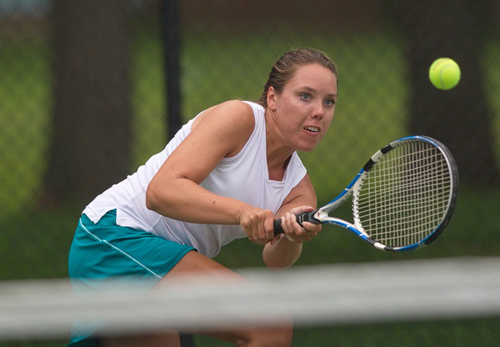 GARRET MEADE PHOTO | Mattituck High School graduate Kate Freudenberg won the women’s singles final in the Bob Wall Memorial Tennis Tournament at Tasker Park in Peconic earlier this month. With the U.S. Open getting underway this week at Flushing Meadows on the opposite end of Long Island, perhaps this is an inopportune time to ask if tennis is, indeed, a dying sport. After all, the full attention of the wide world of sports will be on our national championships over the next fortnight, but still there are indicators that the sport is in eclipse, in these United States in general and on this North Fork in particular. The indicators are numerous. Although American Serena Williams currently reigns supreme among women professionals, only one American man is in the world’s top 20 — John Isner, at No. 17. Long gone are the halcyon days of McEnroe, Agassi, Connors and Sampras. Europeans and South Americans have dominated the men’s game most recently and there appears to be no end in sight to this trend. Locally, the tennis scene is in even more trouble. Earlier this month, three of the seven divisions of the 35-year-old Bob Wall Memorial Tennis Tournament — women’s doubles, mixed doubles, men’s open doubles — were not contested due to a lack of entries. Again this year, tournament director Jim Christy pretty much had to beg players to enter the mid-summer event. And that was not the case a decade or more ago, when upwards of 75 local players would enter the Wall Tournament. So, what happened? First and foremost, the population of the North Fork is aging, which means there are fewer young people around to pick up the game. Then there is the reality of there being no tennis-only club, indoor or outdoor, between Quogue and Connecticut. Both private country clubs here, North Fork and Laurel Links, have two Har-Tru courts, but the tennis scenes at both clubs are modest by all accounts. There are some exceptions to this trend, of course, most notably the “drop-in” tennis scene at the Tasker Park courts in Peconic, where players of intermediate ability and up, sometimes up to 20 of them, show up daily for some round-robin play. And then, of course, there is the so-far-under-the-radar bid, about which I am bound to a certain level of secrecy, to establish a South Fork-style indoor-outdoor tennis facility here on the North Fork. All I can say about it is that some legitimate players — in terms of both their tennis and business credentials — are involved in this effort. And all I can do is cross my fingers. The return of the U.S. Open also marks the anniversary of one of my most mortifying moments as a columnist, wherein I opined, in this space in 2002, that Pete Sampras was over the hill and should consider retirement. Two weeks later, he won his fifth U.S. Open championship. Yes, indeed: columnist opened mouth, inserted foot. GARRET MEADE PHOTO | John Czartosieski, who had not played in the Bob Wall Memorial Tennis Tournament in about 15 years, won the men’s 50-plus singles title. This sort of behavior on a public street would draw strange, worried looks, but on a tennis court, no one thinks twice about it. Tennis players talk to themselves. Both players had their moments, moments when they could be heard talking to themselves. In anger or disgust, they chastised themselves for things such as hitting the ball to the wrong spot, not positioning themselves correctly, burying a serve into the net. Thus, the self-directed chatter. In the end, it was the player who did a little less talking, John Czartosieski, who walked off the court on Sunday morning as the new men’s 50-plus singles champion of the Bob Wall Memorial Tennis Tournament. Czartosieski, the fourth seed, dethroned the defending champion and No. 2 seed, Chizever, 7-5, 7-5, in an entertaining, if flawed, contest that matched the beautiful weather it was played in at Robert W. Tasker Memorial Park in Peconic. Czartosieski, 51, said this year marks the first time he has played in the tournament in about 15 years because of availability issues and three anterior cruciate ligament reconstructions in his right knee in the last 11 years. But Czartosieski’s right knee looked good, as did he. In fine physical condition, Czartosieski appears younger than his years. Following the 1-hour, 49-minute match and before the Riverhead man was presented with the championship plaque, he was jokingly asked for proof of his age. Chizever, 57, of Aquebogue may have wondered himself how old his opponent is, but Chizever put away 23 winners and did well to make Czartosieski work hard for his points. GARRET MEADE PHOTO | Richard Chizever’s steady serving and 23 winners made John Czartosieski labor in the men’s 50-plus singles final. The match was a back-and-forth affair. With the exception of the final three games of the first set that Czartosieski won, neither player strung together more than two games in a row. The competitiveness of the match was reflected in the total points count, 86-80, in Czartosieski’s favor. Neither player expressed pleasure with how he played, though. Czartosieski wasn’t happy about committing 12 double faults (against 19 service aces). While Chizever was more steadier with his serve, double faulting only twice and putting in 74.4 percent of his first serves to Czartosieski’s 63.5 percent, Chizever said he didn’t move his feet enough. That might have contributed to his 16 unforced errors. Czartosieski was less accommodating in that area, surrendering only 5 unforced errors. Chizever was seeking his third men’s 50-plus singles title in the final, which had been postponed a week because of rain. He has a 0-3 career record against Czartosieski. That includes a three-set loss to him earlier this summer in the first round in the men’s singles competition of the tournament, which is sponsored by Times/Review Newsgroup. Czartosieski reached the semifinals of that bracket before falling to the eventual champion, Chris Ujkic. While spectators seemed to enjoy watching Sunday’s match, the experience may not have been as gratifying to the players. Tennis can be trying at times, there’s no question about it. The trick is for a player to have the ability to pull himself up when he feels the tide turning against him. It’s not easy, though, and that’s when players sometimes start talking to themselves. “You try to talk yourself back into winning, and you think you can,” said Chizever. Both players said that talk can sometimes be counterproductive, though.